Includes one red and black fabric Deadpool mask. Mask is one size fits most. 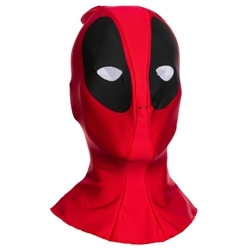 The Deadpool adult overhead mask is styled after the Deadpool costume from the 2016 movie Deadpool. This mask makes a quick and easy costume for Halloween and can be paired up with our other Deadpool costume accessories. Deadpool also go by the names Merc with a Mouth, Regenerating Degenerate, and Wade T. Wilson.